new Celebre Pro HD Foundation and its fabulous! Not only does it give flawless, coverage, but its ingredients are actually good for your skin too! The foundation comes in 20 colours, all of which can be bought individually, or as a palette for professional makeup artists. I am lucky to have the full colour range palette – it’s a key essential in my kit and I’ve used it on photo shoots, film sets and backstage on fashion shows. The palette comes in four shades of each; light, light medium, medium and dark as well as colours specific for Chinese and Japanese skin tones. Each colour is silky, satin smooth and you can build up the coverage as much as you need to. The Black Eyed Peas, Pink and Hilary Duff have all used Mehron’s products on stage, and, in February 2014, Mehron sponsored the makeup products for designers Bora Aksu, Haizhen Wang and Gyunel for the runway at London Fashion Week AW2014, using the Celebre Pro Foundation. Celebre Pro HD Foundation is available from Treasure House of Makeup the exclusive stockist and distributor of Mehron in the UK . This entry was posted in Beauty Products and tagged Academy of Freelance Makeup, AOFM, Bora Aksu, Celebre Pro HD foundation, foundation, Gyunel, Haizhen Wang, HD, katrina stamp, LFW, London Fashion Week, Makeup, Mehron, runway, Treasure House of Makeup. I’m sure you’ll have heard the phrase ‘putting on my face’ – it’s often used! Putting your face on can make you feel like someone new and give you confidence to face the world and hide what you may not want others to see. It’s like transforming yourself into who you want the world to know. And ‘war paint’. War paint is another term used, albeit more tongue in cheek! But war paint was exactly what warriors wanted – a mask painted on, and often with body paint too, applied to frighten their enemies in battle, giving them a monster like appearance and making them appear more fierce. From history we know that makeup use is ancient. And we know that it was used around 4000 BC in some form by the ancient Egyptians, by both men and women for spiritual and magical practices. The discovery of makeup equipment (palettes, applicators) have been found in ancient burial sites, even in the most humble of graves, and hieroglyphic pictures have given us this insight. Makeup in ancient times would have been made from pigments taken from vegetables and berries to create colour for lips and cheeks, whilst the Egyptians used Udju, made from green malachite (green ore of copper) to create green eye shadow and kohl for black, used around the eyes, creating the almond, cat eye shape favoured by this civilisation. And makeup use has continued throughout our history. In the Elizabethan era it was a sign of good health and prestige to have a fair complexion, as the poorer classes would have to work outdoors, and only rich women would have fair skin. We know of the Elizabethans using Ceruse, which was lead based, to whiten faces, which often resulted in death from lead poisoning! But makeup as we know it today, really started to get going in 1909/1910 with the launch of L’Oreal, Elizabeth Arden, Max Factor and Helena Rubinstein. And since then developments in the cosmetics world mean that it’s not just available for film crews, or the rich and famous who can wear it, but it means we all have access to a fast growing variety of makeup brands and products. Today the UK cosmetics industry alone is worth approximately £2.25bn (source CompaniesandMarkets.com Aug 2013), with the L’Oreal Group being one of the leading cosmetics brands in the world. One of the best examples we know for transforming someone into something different, often completely unrecognisable from how the original person looked, using makeup is special effects (SFX) makeup. This is used widely in films and TV to create Sci-Fi characters, horror film monsters a nd zombies as well as to create bruises, wounds and cuts from the simple to the most horrific. 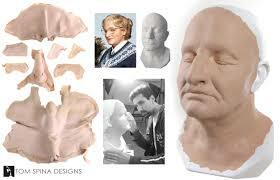 If you’ve seen the film Mrs Doubtfire (1993) you may know that the main actor, Robin Williams was famously made up with eight separate pieces of prosthetics and underwent four and half hours each day in makeup to have the prosthetics applied to transform him from the actor we know into his female film character. But makeup alone, without SFX and any prosthetics, can still transform a face completely! By using dark to shade and light to highlight specific areas, you can appear to change the actual face shape entirely. 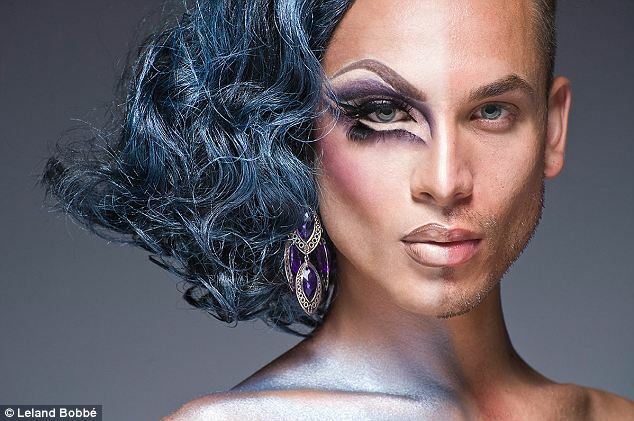 We see this with talented drag artists who use the technique when applying their makeup to change the shape of their male face into a female one – male and female bone structures are slightly different, and makeup can help them create the illusion of being female. Have a look at this image (Leland Bobbe) – the artist is half made up so you can see more easily where dark areas appear to create hollows or deep set areas and the whiter highlights make the area appear more prominent. In makeup, we use the terms ‘dark takes back and light brings forward’. And here, this step by step picture of highlighting and shading a face using makeup alone transforms the m odel’s face. 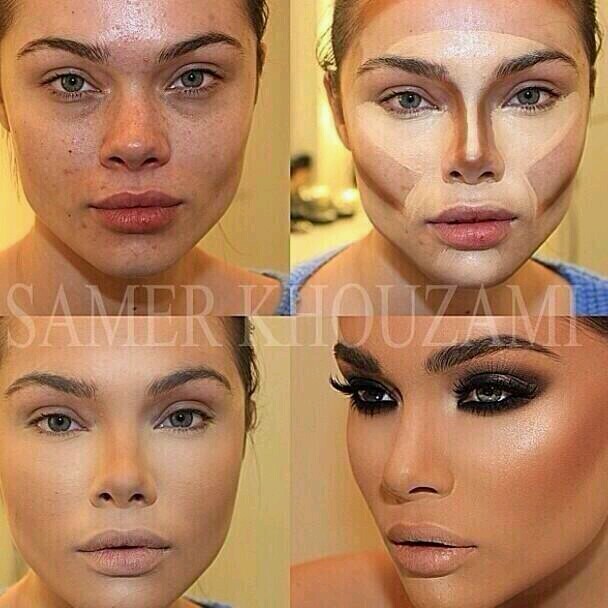 The model looks totally different at the end with shading, highlighting, eye makeup, blusher and lips all applied. Try it with your own makeup. Use a dark matt shade to contour your face, creating hollows under your cheek bones. This makes your cheek bones appear more defined. Apply light to the actual cheek and brow bones and these areas are considerably more prominent. This entry was posted in General and tagged contouring, Cosmetics, drag makeup, highlighting, katrina stamp, l'Oreal, Makeup, Max Factor, Mrs Doubtfire, prosthetics, SFX.